1. Mix up your practices. Our bodies get used to routine, which is why people circuit train or alternate the days they exercise different muscles. One of the best ways to get out of a swimming plateau is to mix things up at the pool. Consider adding more speed work, changing yardage and intensity, doing hypoxic sets, focusing on other strokes or even kicking and pulling. Be aware of your heart rates, threshold and training plan. Get out of your comfort zone! 2. Join a team. Whether it be a masters or club team, there will be athletes of all levels. Sometimes all you need is that competitive spark to push you to that next level. 3. Incorporate dryland work into your routine. Yes, we swimmers call working out on land “dryland,” we’re so weird... Some of the best supplements to your swimming routine include erging, stretch cords, medicine balls, lifting, TRX and core work. I have never met a decent swimmer who didn’t have a strong core. 5. Get your stroke analyzed. If you feel pretty confident about practicing alone, it is still a good idea to ask a buddy to record your stroke so you can watch it later or even hire a local swim coach for a lesson or two – just to see if they notice something you aren’t aware of. 6. Do test sets. Use test sets every once in awhile to gage your current fitness level and track improvements over the course of the season. Don’t be afraid to reuse test sets. Maybe it’s boring, but it is also very informative. Do not do test sets every day! They are special. Did you swim your own race or did you let other swimmers influence your race? Were you scared you wouldn’t finish only to find you had too much energy left at the end? Did you lose a cap or have your goggles fall off? Did you swallow a lot of water or get disoriented because you didn’t breathe to the front enough? Were you able to finish the distance you’re swimming at your big race? Is there something you could be doing better to help you prepare for your next race that you wouldn’t have noticed at practice? 8. Increase Drag (at practice). Many swimmers wear two swim suits at a time and sometimes they practice in footless tights. Some girls wear male drag suits over their regular suits. If you know you’re going to be racing in a wet suit, occasionally practice in a wet suit. 9. Decrease Drag (by race day). Are you aware that NASA helped design Speedo’s LZR swim suit to help reduce form drag? The suits were so fast they’ve since addressed competition suits in swimming rule books. There are still competition legal suits out there that compress parts of the body and help body position in the water, the drawback is they are expensive and won’t make a difference if you have to wear a wetsuit. Don’t worry though, there are some fantastic triathlon wetsuits and swim skins on the market too! You can always work on your streamline and body position to reduce form drag too. 10. Think Positively and understand plateaus are a natural progression. In the beginning, it is easy for athletes to improve. It is an exciting process and time just seems to fall off whenever you race. At a certain point it becomes more difficult. Sometimes plateaus can be overcome with a small tweak here or there. Sometimes, the reason you plateau is because you are getting closer and closer to the best that you can be. When you hit this second type of plateau, try not to freak out about it (yes, I know this can be impossible for us type A’s) and congratulate yourself for reaching the point in your training where the way you train and taper has become critical to improvement. View it as a challenge and remember athletes thrive on challenge. I spent three years within .03 in my 50 free. Imagine that for a second. I trained between 4 and 6 hours a day to drop one hundredth of a second in my 50 over the course of three years! All that work for two laps. Down and back. I went a 23.33 at regionals my junior year of high school, a 23.34 my senior year of high school (got buried by the wave from the two girls coming at me as I pushed off the wall at state) and a 23.32 at Big Tens my freshman year with an injury. You know what? It was worth every second!!! 11. Take a short break. Sometimes, not all the time, but sometimes we just need a little room to breathe. Training, especially for endurance athletes can be overwhelming, even daunting at times. Every once in awhile it is good to take a step back and allow your body and mind to recover so you can resume training with renewed focus. Maybe you need an afternoon or a morning to recover. Maybe you need a day or two to realize you actually miss training. Maybe you need a week or more at the end of the season. If you take a break and don’t miss it at all, it could be time to focus on something else for awhile. There’s nothing wrong with that either – this is your life and you should be doing something that makes you happy! Have you ever hit a plateau in your training? What did you/ are you doing to overcome it? Please share your story in the comment section. Very good article, as usual. Lots of information for any “level” swimmer. Thanks! Thanks! I’m glad you liked it. This was one of those articles that just wrote itself, I’ve definitely been there! How about you? Was there anything in particular that resonated with you and your training? We have similar competitive streaks. I remember the post you mentioned – it was the first post of yours I’d read and it really resonated with me! Have you weight trained before? Lifting is one of my favorite ways to workout. Hahaha, well guess there’s no hope I’ll grow out of it. Lifting helps prevent osteoporosis, in fact I hear it is one of the best things a gal can do. Man, this was awesome. It could become my training bible. I think this is the first time it really sank in that swimming isn’t just swimming. Ie… I have been trying to build my distance and comfort factor in the water by just swimming a certain distance, usually 1,500 yards each time. But clearly, just like running and the bike, there has to be cross training and attention to a lot of other details. And how easy it is to forget about warming up and cooling down. I posted a story about my first Olympic tri swim and it is a great example of everything that is opposite to your great ideas. Thanks for the insight. Oh, wow! What compliment!!! Thank you. I will tell you that your comment is the exact reason we want to help triathletes. So many of you guys are in charge of every aspect of your training – and that isn’t easy! Everything we say here we’ve learned from personal experience either as an athlete or coach. Some of it will work for some people more than others, but I think it will help triathletes more than swimmers who have teams or coaches to plan their training. I will tell you that I think a person’s mind is crucial to their training and swimming 1500 meters at a whack isn’t a “problem” until it is. What I mean by that is that you might get to the point where you physically level off or you get to the point where its just not working mentally. It is all about finding the right balance that works for you. I will look for your post on your first Olympic Tri and I’m glad we were here to open your eyes on what you can do in the water. 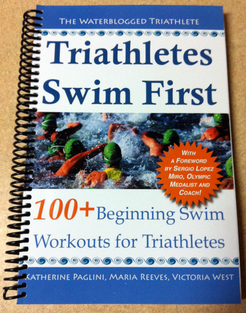 I don’t think swimming the way you’ve been swimming has hurt your training at all. If anything its gotten you a great base and now you’re ready to try new things to get to that next level! Thank you so much for sharing that! You should be able to build up to 2,000 by January no problem. I bet you could do it now. What’s another 500 on top of the 1500 you’re already doing? Give this a try if you like: swim your 1500 straight and then add 4 x 100s descend 1-4 at :30 rest*. Then do a 100 easy working on sighting. Done and done. *Descending is when each one is faster than the one before. Since it is your first time, go slow on the first one and descend to a speed that pushes a little bit but not too much. I’m trying to build your confidence and get some more yardage in, not make this set difficult. I’m in! I’ll try that tomorrow. Thanks for defining descending. These swim workouts look like a whole new language to me. I’ll let you know how it goes. Thanks! Great! I can’t wait to see how it goes. If it’s too much, scale back but I hope you surprise yourself!